Praise to the Lord, the Almighty, the King of creation! O my soul, praise Him, for He is thy health and salvation! All ye who hear, now to His temple draw near; Praise Him in glad adoration. Praise to the Lord, who o'er all things so wondrously reigneth, shelters thee under His wings, yea, so gently sustaineth! Hast thou not seen how thy desires ever have been granted in what He ordaineth? Praise to the Lord, who doth prosper thy work and defend thee; surely His goodness and mercy here daily attend thee. Ponder anew what the Almighty can do, if with His love He befriend thee. Praise to the Lord, O let all that is in me adore Him! All that hath life and breath, come now with praises before Him. Let the Amen sound from His people again, gladly for aye we adore Him. Fear not, I am with thee, O be not dismayed, for I am thy God and will still give thee aid; I'll strengthen and help thee, and cause thee to stand, upheld by my righteous, omnipotent hand. The soul that on Jesus has leaned for repose, I will not, I will not desert to its foes; that soul, though all hell should endeavor to shake, I'll never, no never, no never forsake. Heavenly Father, the death of our dear Art and Gloria has filled our eyes with tears and our hearts with sorrow. We are distressed by the mysteries of Your providence. As Your children we want so much to say, "Not my will, but Thine be done," but at times we find it difficult to do. Forgive us and help us, we pray, by Your Holy Spirit, to accept Your ways as always best. Apply to our wounded hearts the healing touch of Your precious promises, and let us soon experience its power. Teach us not to mourn as those who have no hope. Wipe away the tears from our eyes that we may be able to see through the mist, beyond the death and grave, to the resurrection and life assured by the glorious victory of our Savior Jesus Christ. May the passing of Art and Gloria remind us that we, too, are but pilgrims and strangers on earth. Grant us the grace to love less and less the things that are material and temporal, and to love more and more the things that are spiritual and eternal. Teach us to number our days and to apply our hearts to the wisdom taught by Jesus Christ, that He is the Way and the Truth and the Life, and that no one comes to You but by Him. I am Jesus' little lamb, ever glad at heart I am; for my Shepherd gently guides me, knows my need, and well provides me, loves me every day the same, even calls me by my name. Day by day, at home, away, Jesus is my Staff and Stay. When I hunger, Jesus feeds me, into pleasant pastures leads me; when I thirst, He bids me go where the quiet waters flow. Who so happy as I am, even now the Shepherd's lamb? And when my short life is ended, by His angel host attended, He shall fold me to His breast, there within His arms to rest. My hope is built on nothing less than Jesus' blood and righteousness. I dare not trust the sweetest frame, but wholly lean on Jesus' Name. (Refrain) On Christ the solid Rock I stand, all other ground is sinking sand; all other ground is sinking sand. These words were taken from a plaque that Roger presented to Art on his 75th birthday. Since Webster's defines a hero as "a person admired for their achievements and noble qualities" and "an object of extreme admiration and devotion," my first thought goes to my Dad. My Dad has trained me for life and has provided me with many opportunities. He has modeled humility, stewardship, gentleness, consistency and contentment, to name a few. As a young boy, my Dad would take me golfing early every Tuesday morning during the summer. As a high school student, I can't remember one athletic event that my Dad (and Mom) missed. My sister and I were their highest earthly priority while we were growing up. Growing up in a small city with more than others could distort a kid's view of life. As I look back, my Dad (and Mom) did a great job of keeping my sister and me from "getting a big head." They were masterful at the right mix of pride and humility keeping us from thinking it was all about us. My parents opened up the world to my sister and me through extensive travel before graduating from high school. From my childhood all of the way through college, our home was open to hundreds of people. I can't count how many kids had a home-cooked meal in our home or how many kids would hang out at our home. With approaching teenagers in our home, it amazes me that my friends and me throughout those teenage years thought that my Dad was cool. It's very risky coming home to work in the family business without outside experi-ence. I'm thankful that it worked for me and I give my Dad that credit. As I look back, I'm amazed at how he taught me to make decisions and how he was willing to give me so much responsibility at such a young age. My Dad has always shown great confidence in me which I believe is one of the most important success motivators for anybody. To me, my Dad's business success also makes him my hero. During his 42-year career, he multiplied his business revenue over 1,000 times. To my amazement, he was not a big reader or fan of consultants. He just knew what to do, was steady and had guts. Most importantly, my Dad (and Mom) taught me the importance of faith in God, how to give strategically to Christian ministries and the importance of relevant weekly church experience. In conclusion, if I could have a fraction of my Dad's wisdom throughout my life, I would consider myself a fortunate person. These are excerpts from a short story Karen penned about her mother when she was in junior high in the late 1970s. Once upon a time there was a man named Arthur, and he fell in love with a lady called Bertha. They were a very happy couple serving the Lord faithfully at Friedheim's Zion Lutheran church and farming with all their hearts. On March 11, Bertha gave birth to a lovely little girl. They named her Gloria, which was indeed appropriate because the Lord had given Arthur and Bertha an Angel. As this beautiful Gloria grew up, she portrayed the characteristics of a real angel, and every day Arthur and Bertha would smile with glee realizing that this child was an angel of God. Gloria worked hard on the farm for her parents, canning and especially preparing meals. As she grew up, Concordia High School was graced with her presence. Even though she was not Miss Popularity, everyone she knew sensed something truly special about Gloria. Later they would realize that she was indeed an angel. Gloria then worked at the county extension office where the 4-H program truly prospered. County, district, state, and yes even national Rural Youth benefited as Gloria possessed those true leadership characteristics. This angel knew and practiced the real key to success -- allow God to have control of your life and think of others before yourself. She did possess JOY -- Jesus, others, and yourself last. 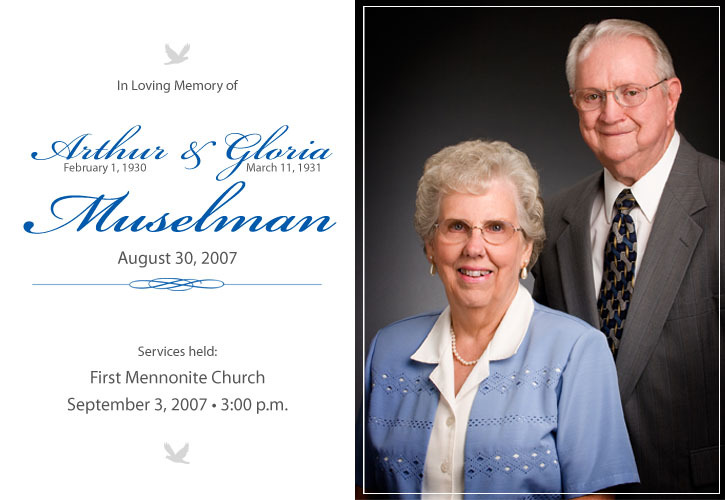 Gloria, an angel to all -- a servant to all. As we all know, this angel thought that it would be BEST to truly give her love to one special person, and when a wonderful man named Arthur (just like her father) came along -- she knew that it was God's will for them to be married. Once again, her angelic qualities shined as she was the ideal wife for Arthur. Gloria, the angel, had so much love to give away that she and Arthur decided they should have children. The Lord blessed her with two children she and Arthur named Roger and Karen. She once again loved them more than any human could love -- this was again proof of her angelic qualities. She would do anything for her children. She knew the first shall be last and the last shall be first -- of course, she was an angel from heaven. In the meantime, Gloria helped others too. Swiss Village volunteer work, Peace Lutheran Church work, and the best 4-H leader in the country - kept this angel on her toes. The success that was hers was because of her genuine LOVE -- only an angel could do all of this. The Berne community realized that she was an angel and crowned her with the "Angel of Mercy" title. Gloria -- gives constantly even when she doesn't receive anything in return -- only an angel could do that. Before we can say that she lived happily ever after, you are probably wondering why the author of this story knows so much about this angel Gloria. That's simply because she is my Mom. God blessed me so much when he let my Mom be an angel -- she loves me so and helps me with all of my work. Someday -- I hope that even though I'm not a true angel like she is, I can work for others like she does -- be as loving and as serving as she is. YES, I must thank God for giving me a real Angel as a Mom. Even though many don't know that she is the reason for my success they will when we are all in heaven because she will sit right next to Jesus living happily ever after. These are excerpts from an e-mail Karen sent Gloria the Friday before Mother's Day in 1998. Gloria laminated the entire e-mail and to this day it is taped inside her kitchen cabinet. The way you have modeled helping the "poor in spirit"
Print this out and keep it close to your heart. I am writing this all very sincerely! Have a Happy Mother's Day and rest assured you are a great mother! I love you, Karen"
Click below to download this document in PDF format. Please note: To download these documents, you will need Adobe® Reader®.